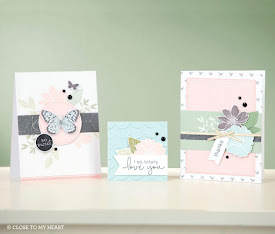 It is already time for the September Close To My Heart stamp of the month blog hop! If you're already hopping, then you probably arrived from Priscilla's blog. 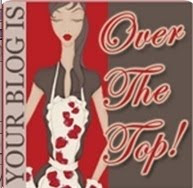 You'll go to Lisa Sargent's blog next. This month's stamp of the month, Poster Tidings, features two large "subway art" style of stamps: one for fall and one for winter. 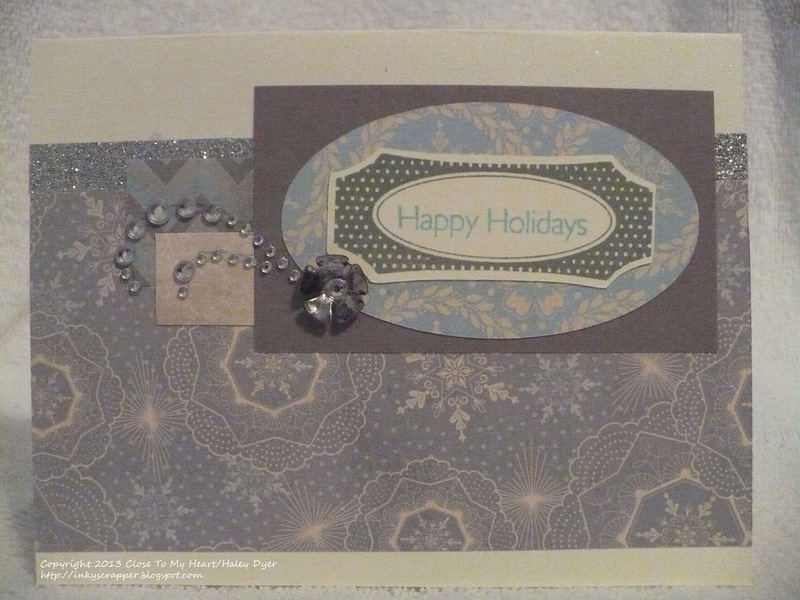 For my card, I challenged myself to use the Huntington (fall) paper pack with the winter stamp. 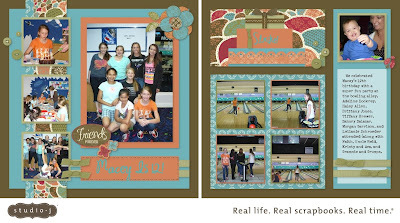 To make it, I used a pattern from the Make It From Your Heart, Vol. 2 how-to guide that I modified to fit the large, central tag. The tag was cut from Colonial White card stock with the Art Philosophy cartridge. It cuts the tag and the tree for you! 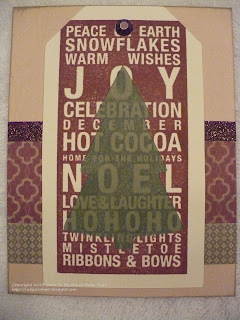 After stamping with Barn Red on the tag, I stamped the tag on Olive card stock with Olive ink and then attached that piece behind the tag. 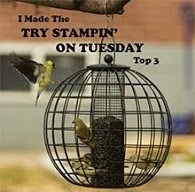 It was pretty to easy to line up the stamped images. 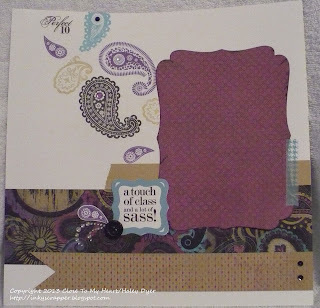 The gorgeous background paper is from Huntington, plus I used a Champagne card stock base. Bronze shimmer trim and an adhesive gem from the Rosewood collection makes this an easy holiday card to mail. Thanks for hopping by! Now see go Lisa's pretty creation! It's a Big Idea Festival! This year's Big Picture Classes "Big Idea Festival" theme is childhood memories. 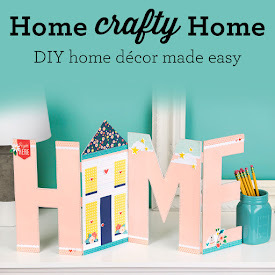 Join me and lots of other crafty friends for 10 days of FREE fun! It all starts 9/5, so sign up now! 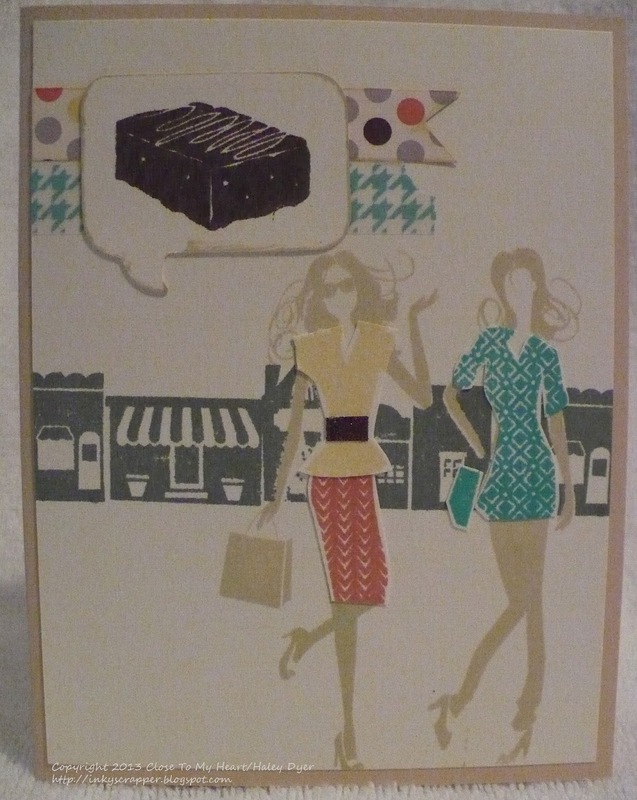 Here's the card that my guests made at my recent CTMH Autumn/Winter "A Chocolate Affair" Open House. Since I' a teacher, I couldn't resist stamping the brownie (Chocolate) and the "brownie points" sentiment (Champagne). Is your mouth watering yet? Can you guess which paper pack I used? Can you believe it's Babycakes? Don't you love that pop of Lagoon? Also, my card base is Champagne card stock, which is probably my new favorite neutral. 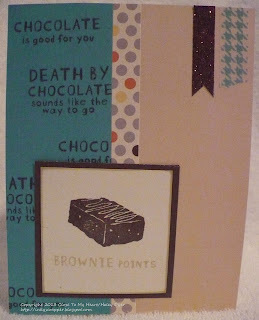 Of course we used Chocolate ink and card stock too. The bronze shimmer trim and Lagoon washi tape pennants are even pretty in person. If you haven't received your complimentary Idea Book, please let me know so I can get one to you ASAP. I've also got my fall class line up scheduled and ready to share, so again let me know if you're interested. Don't forget that you only have a few more days to get your A Chocolate Affair ($17.95 or FREE with a $50 minimum purchase). Click HERE to order! H2H Challenges Make a Scene Meets CAS(E) this Sketch! 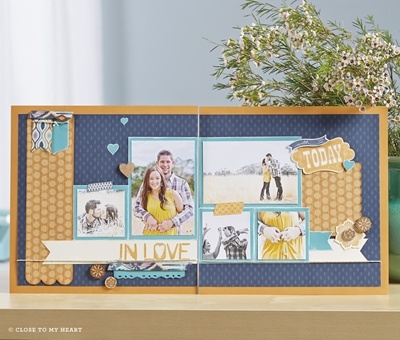 This week's Heart 2 Heart challenge is to use your stamps to create a scene. Now, most people are probably thinking flowers or something in nature, but my thoughts went in a different direction. 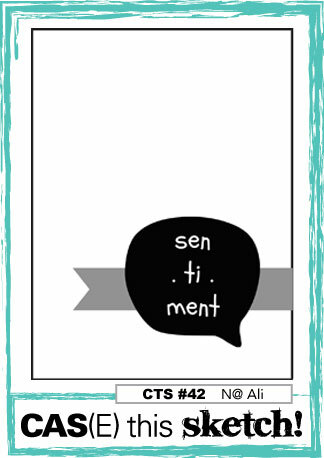 When I saw the CAS(E) this Sketch #42, I knew that I wanted to use my CTMH Cricut Artiste cartridge to cut out a word balloon. To create my card, I turned the sketch upside down and grabbed my Fashionista stamp set to pair with the August CTMH stamp of the month, A Chocolate Affair. Would you believe that the Babycakes paper pack is my palette? First, I stamped the two girls with Champagne ink onto a 4"x5.25" piece of Colonial White card stock. I also stamped them on some scrap paper to make a mask, and then I stamped them again in Buttercup, Sunset, and Lagoon to paper piece their clothing. The street scene is one of the Fashionista stamps that I had to stamp twice in Slate to stretch across the page (after creating the masks for the gals). I distressed the speech bubble with Champagne ink, then adhered it over the Babycakes polka dots and the Lagoon washi tape. What's better than shopping with girlfriends with a little chocolate thrown in? Be sure to check out how the H2H DT interpreted the Make a Scene challenge, and be sure to check out the other CTS entries too. 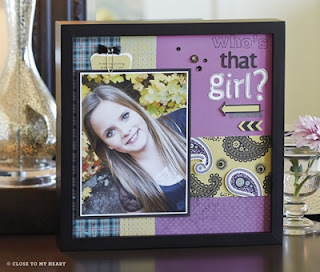 When I uploaded my daughter's 12th birthday pictures to Studio J, none of the birthday kits really made the photos pop. 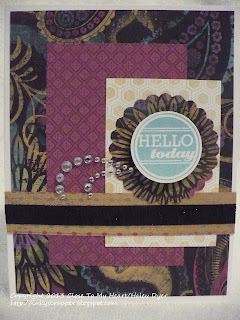 The Stella collection was a great match, so I turned it into a birthday layout with a stack of "presents." 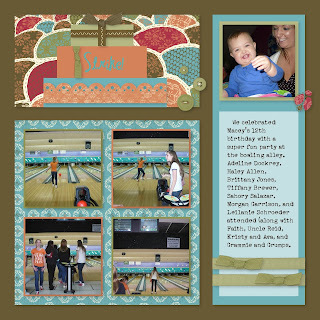 To make the "presents" (which also makes a fabulous tiered cake), add a text box from the Studio J Text & Photo Areas tab. Drag it where you want it, resize it as needed, and then choose the color that you prefer. 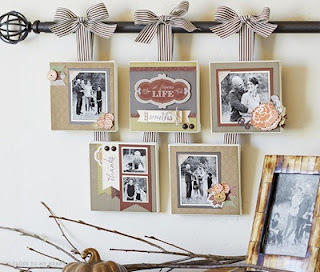 I embellished mine with different My Stickease borders (cropped and rotated to fit), a My Stickease title, and ribbon. It is so hard to believe that our baby is 12! 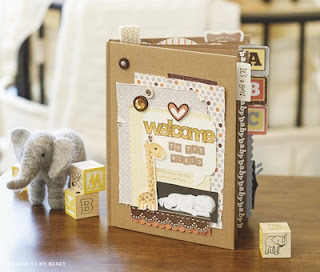 The Laughing Lola paper pack is my current favorite from the new Idea Book (although I know I am going to fall in love with more of them as I use them! ), and when paired with the NEW Paisley Perfect stamp set, I can't help but think of my girls. I can't wait to find the perfect picture of them to add to this layout! To create it, I cut the photo mat and the sentiment frame with my Cricut Art Philosophy cartridge. I used Black, Gypsy, Bamboo, and Crystal Blue inks for my stamping. 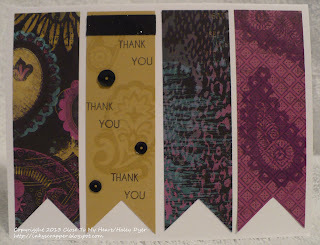 For embellishments, I used the new Black Mini Medley collection, Sparkles Flourishes, lots of black, white, blue, and purple Sparkles, and a strip of Lagoon Washi tape. Too bad you can't see the glitter on the black button very well! While I had my supplies out, I created this quick thank you card (with the addition of the Card Word Puzzle stamp set), using a sketch from Make It From Your Heart, Vol. 1. Thanks for joining me! 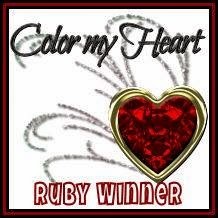 I'm linking these projects up to the Color My Heart Laughing Lola color dare. Now check out Michelle's inspiration next. This weekend I was able to play in my craft room due to the rain (and to unwind from our first week of school!). 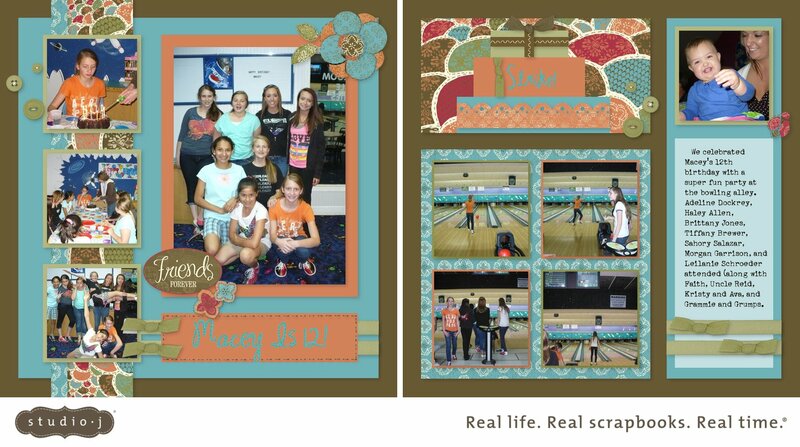 I just love my new Reel Life stamp set, and I used it to create this fun card. The card sketch is from the new Make It From Your Heart, Vol. 2 how-to guide. I was able to use up some of my scraps on it. 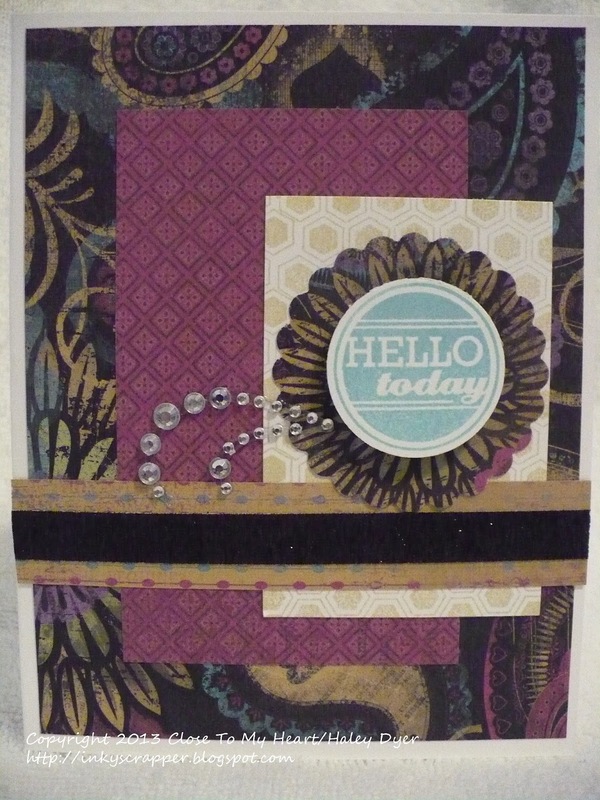 The honeycomb background and sentiment stamp are from the Reel Life stamp set. 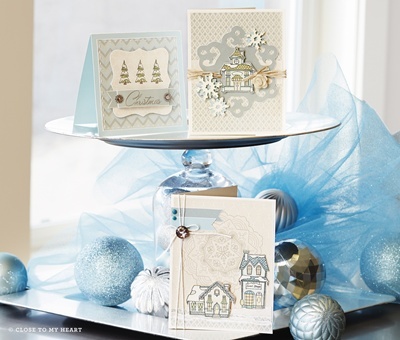 I like how Bamboo and Crystal Blue look with the Laughing Lola paper pack. In case you can't tell, the black band is black shimmer trim. It sparkles so prettily in person! 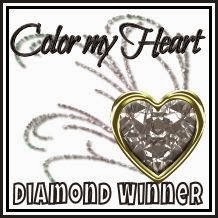 I am linking this card up to the Color My Heart Laughing Lola color dare and the Heart 2 Heart Challenges Sentiment-ally Yours challenges. 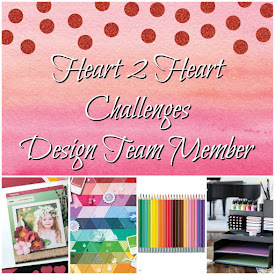 This week's Heart 2 Heart Challenge is to make a sentiment the focus of your project. 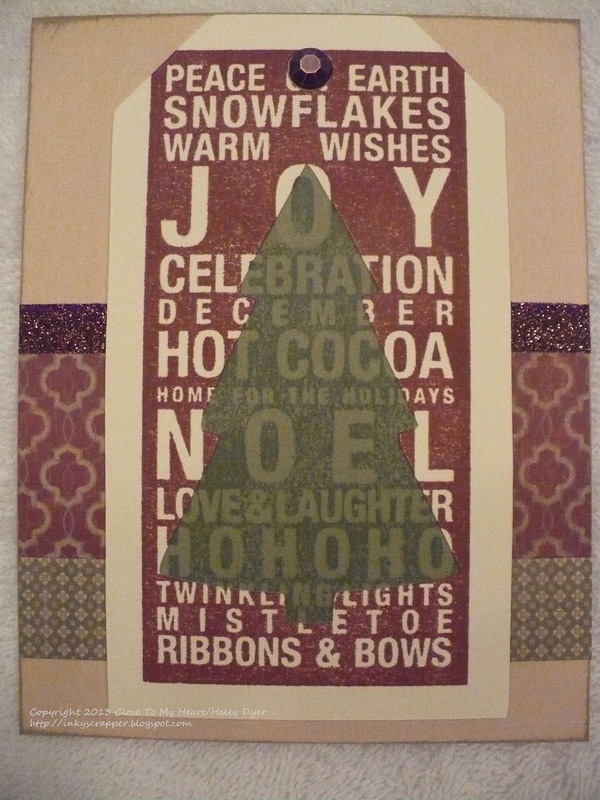 For my card, I started with the Frosted paper pack and the Holiday Tags stamp set. 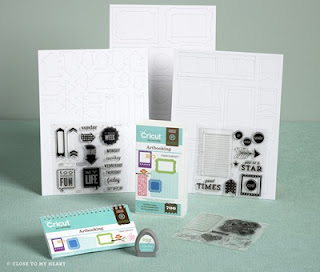 This stamp set can be used with the CTMH Artiste Cricut cartridge to cut out the different tags. (I decided to back my tag with a Cricut oval to show off more of the pretty Frosted paper pack.) I used Slate and Crystal Blue inks for the sentiment. 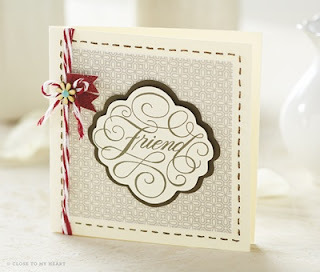 If you look closely, can you see the shimmer and shine on the Colonial White card stock base? I used a mister with pearl paint and. Crystal Blue reinker to spritz the background. 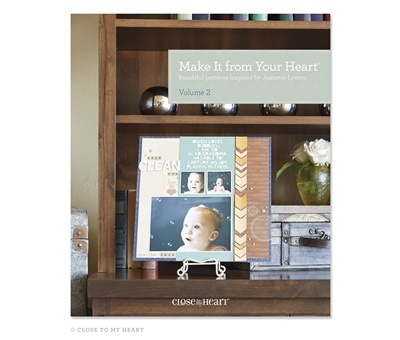 This sketch comes from the new Make It From Your Heart, Vol. 2. The instructions made this card come together quickly! 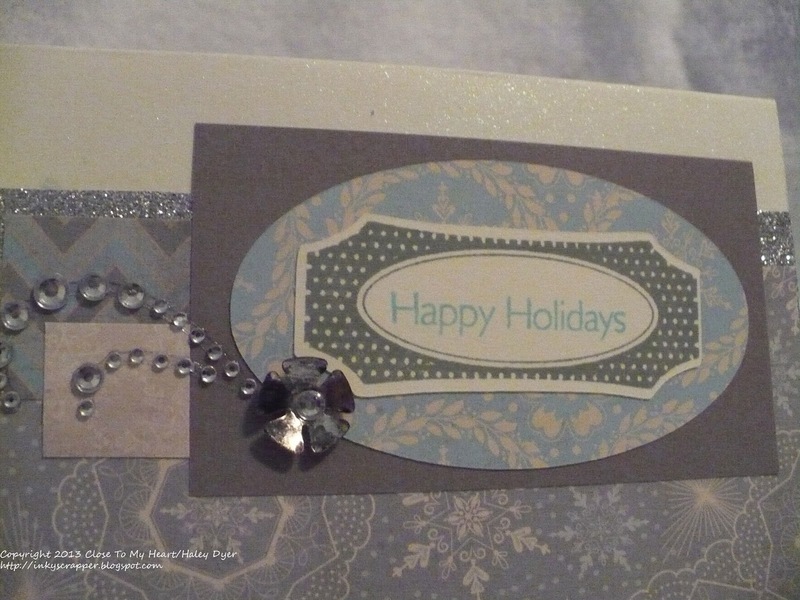 I accented it with silver glitter adhesive trim, sparkles flourishes, and base and bling metal charms. It's never too early for happy holidays! Go check out what the rest of the H2H DT has cooked up for you this week, and be sure to link up your creation by 8/31. A wintry neutral that again can be used for so much more! This collection is beautiful for fall- or any time of year! 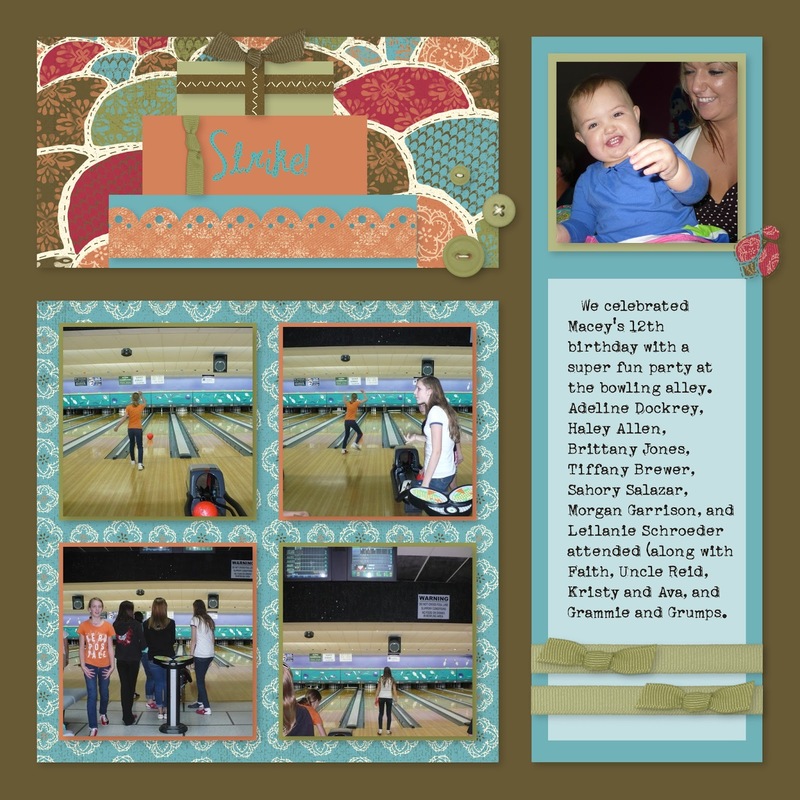 The name says it all: funky, fashionable, and fun! But wait until you see how versatile Laughing Lola truly is! Game on indeed! Not a gamer or athlete? Don't worry- the paper is really cool, and very 21st century! Beautiful colors that you can tone down or ramp up, depending on your style! So, which one grabbed you first? I had to get my hands on ALL of them, and I'll be featuring them over the next six months of classes, workshops, and blog posts. 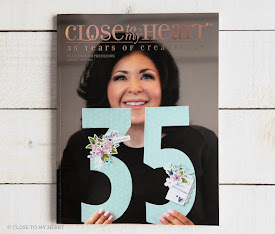 The ALL NEW Close To My Heart Idea Book is now "live," and it's time for me to share some of my favorites (in no particular order) from this edition. (It is so much fun to see and play with all the new things! We got lots of sneak peeks at Convention, so I will have more to share with you each month.) If you'd like to browse through the Idea Book online, just click HERE, and if you don't already have a CTMH consultant, I'd be happy to hook you up with your own personal copy. The two My Crush journals are something new that you are going to love! 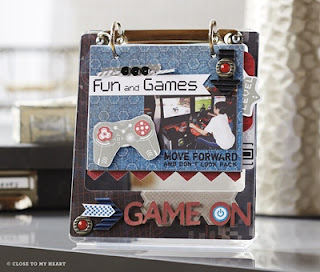 Even if you don't get into the whole "smash book" type journaling/scrapbooking, the additional page elements are something you are going to want to have and use. My daughters can't wait for their books to come in! They are going to become a fun journal of this school year- which starts for them on Tuesday. I started back to work last Monday, so that explains why the blog has been a bit neglected. More to come as we get back to school! 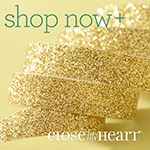 Necklaces, headbands, and rings, oh my! CTMH has introduced a cool line of jewelry that is oh-so-much-more! First, we have necklace, bracelet, ring, and headband metal bases that you can embellish to your hearts content. 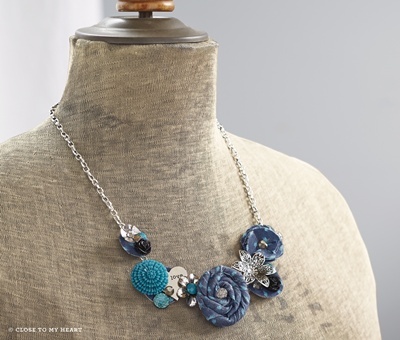 Add some fabric flowers and our amazing Base and Bling embellishments for a trendy, unique statement piece. Not sure the jewelry is for you? I made a version of the necklace (above), available as a kit, and it is darling! 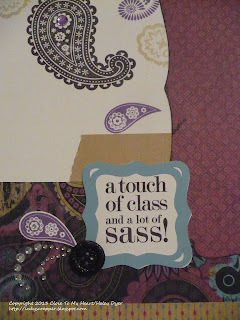 The embellishments are going to show up on just about everything I make (cards, scrapbooks, etc.) because they are gorgeous. 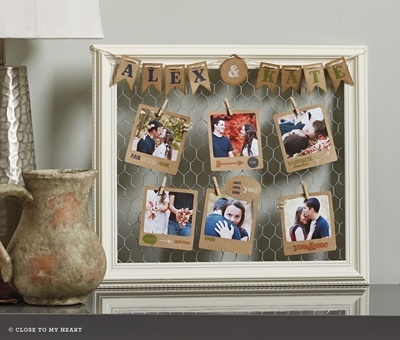 Decorate your home or office with one of our two Designed Decor frames, and then change out the featured artwork as desired. The Colonial White frame has chicken wire to hold your lovelies; the black frame has rows of wire. 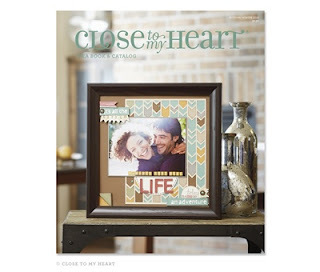 These are a fun way to display what's Close To your Heart! Need help getting your groove on? Make It from Your Heart, Volume 2 is now available, chock full of new scrapbook layout and card sketches. ALL of our previous how-to publications are back in a convenient, affordable spiral-bound format. I love these because they make it easy to be especially creative. Close To My Heart hostesses are being spoiled even more with the opportunity to purchase or earn several exclusive, hostess-only stamp sets, offered at a wonderful price. I am looking for hostesses for upcoming classes and workshops, and hostessing is super easy (at my place OR yours), so please contact me if you'd like to learn more or would like to volunteer to get free CTMH products (inkyscrapper at gmail dot com). Now that I've shared some of our new innovations, I'll be back in a few days to show off our gorgeous new paper collections! 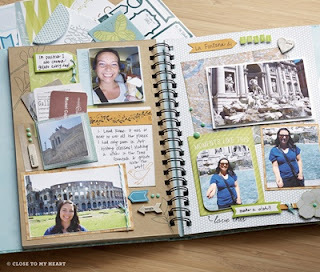 No paper crafter's life would be complete with gorgeous paper!